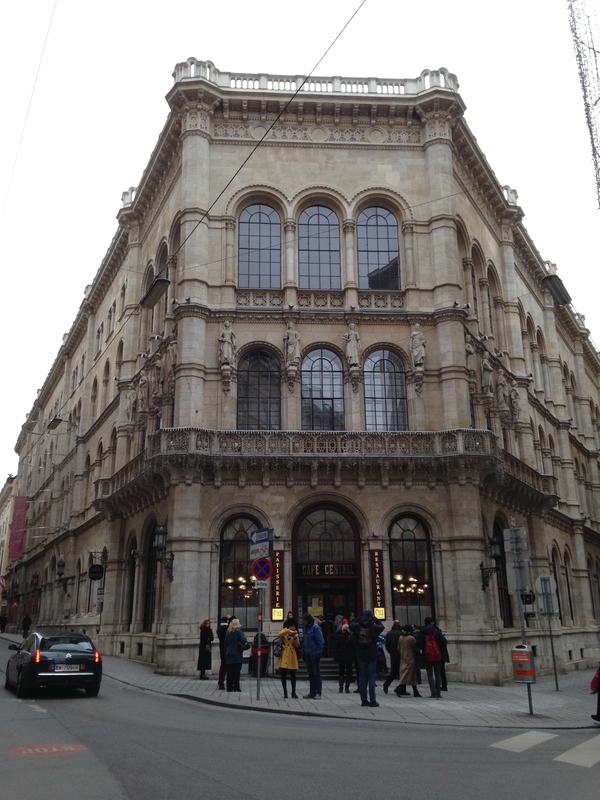 This was our last day in Vienna so we decided to take it at a more leisurely pace. 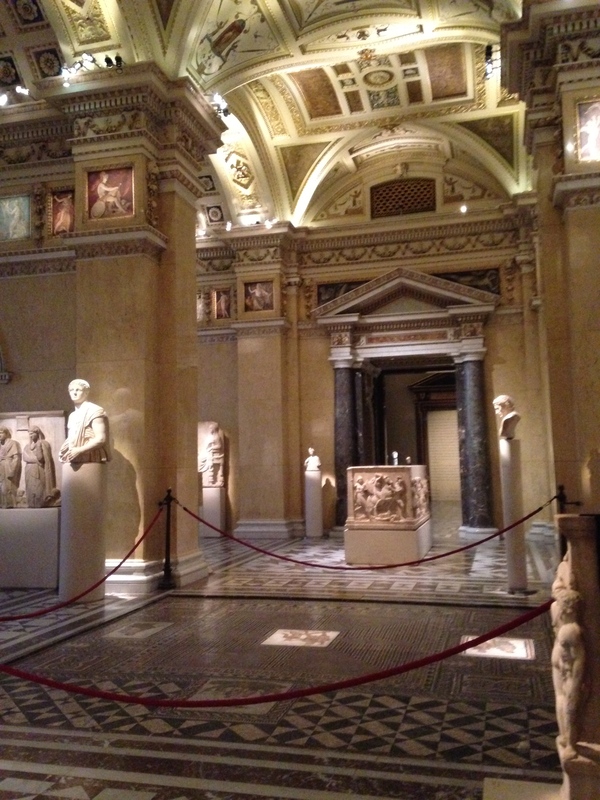 Our first stop was the Museum Quarter so that we could visit the Kunsthistorisches Museum, or Art History Museum. If you look closely at the middle picture in the second row you can JUST make out a bit of artwork above the arches. That was done by Gustav Klimt. My Dad particularly wanted to see a Velásquez exhibit that was on, and Velásquez is one of the few artists that I vaguely remember from my AP Art History class. Sure enough, I recognized some of his more popular works such as Venus at Her Toilet and Las Meninas. To be honest I’d always thought Las Meninas was a rather blah painting so I was interested to see if I found it boring in person. 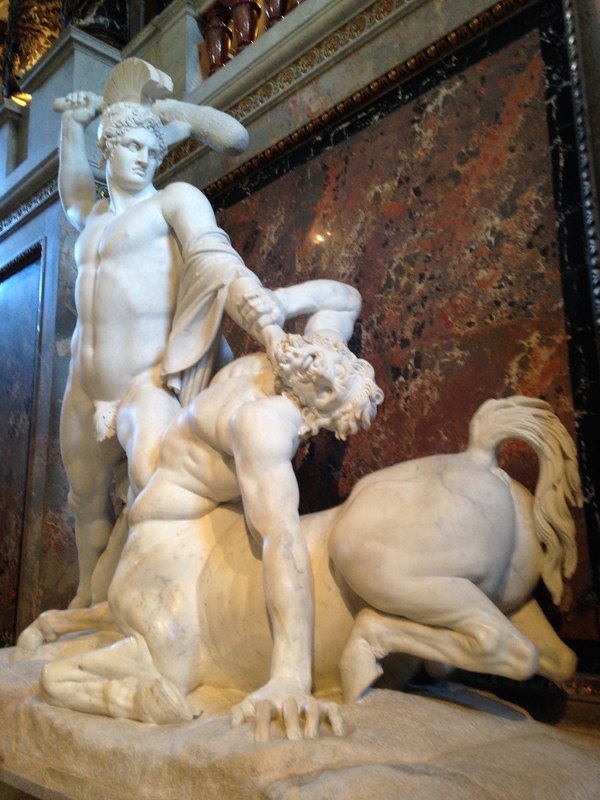 To my great surprise I really liked it…until I saw that it was actually a copy of the one in the Prado. Anyways, I still managed to remember enough art history to point out to my Dad that the entire painting is a rather large self-portrait. Velasquez is the rather shadowy painter off to the left of the painting and the canvas in the picture is supposed to represent the painting Las Meninas. So it’s a painting of Velásquez painting the painting. Trippy right? As for Venus at Her Toilet, the only thing I could remember was that it’s clearly connected to an old and rich history of similar paintings (which at one point long ago I could recall at the drop of a hat). That and the fact that Venus isn’t looking at herself in the mirror. She’s looking at the audience. At the time, this indirect gaze was significant since it represented a shift in these types of classic paintings. 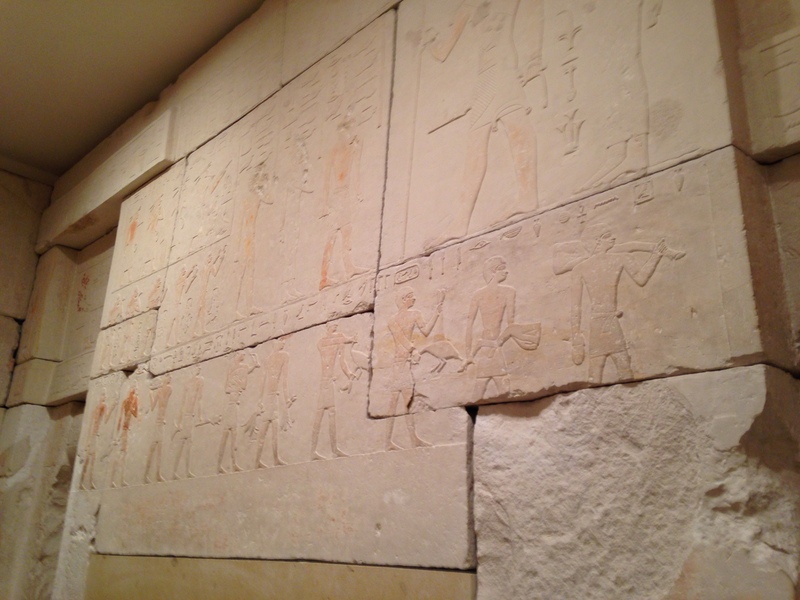 And that’s about all my brain managed to dredge up from the depths of my rather shaky art history memory. After seeing the Velásquez exhibit we walked around the rest of the museum. The top floor mostly contained paintings while the ground level was devoted to a variety of things. 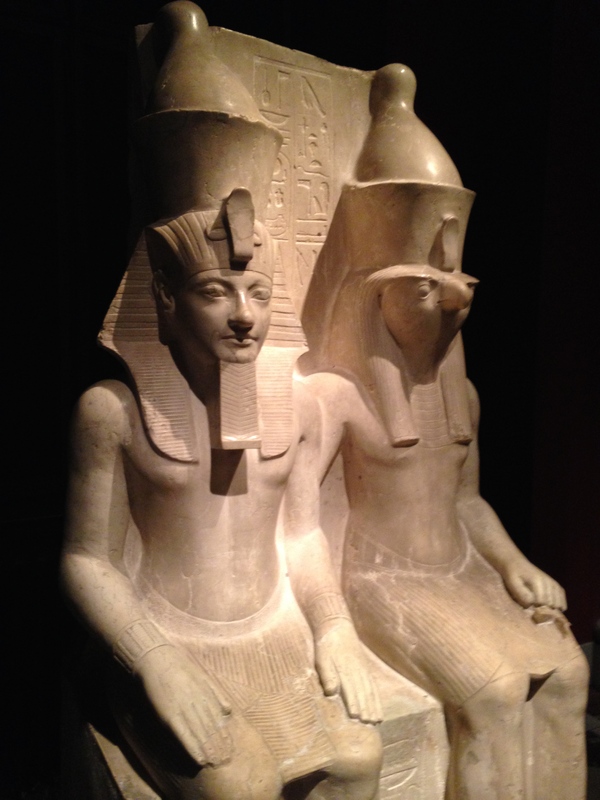 My Dad and I liked looking at some of the old clockwork that was on display, particularly because a lot of the clocks were automatons, but we also had a good time wandering around the Egyptian and Roman artifacts. After that it was time for a coffee break. 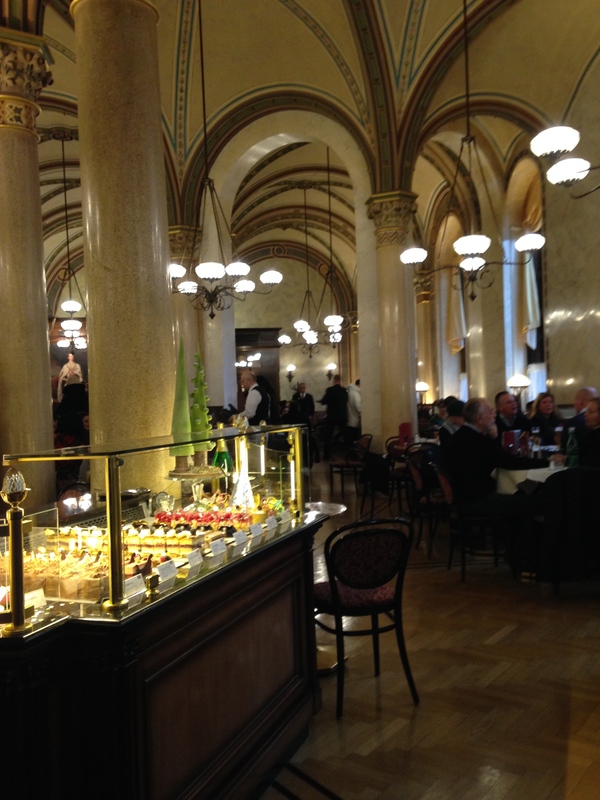 Café culture is huge in Vienna and there are a plethora of well known cafés scattered throughout the city. I decided that it would be fun to visit Café Central. Not only does the café have beautiful vaulted ceilings, it also used to be a favorite haunt of people like Arthur Schnitzler, Sigmund Freud, Peter Altenberg and Leo Trotzki. This meant that my Dad and I were able to sip our coffee and feel somewhat like intellectuals. 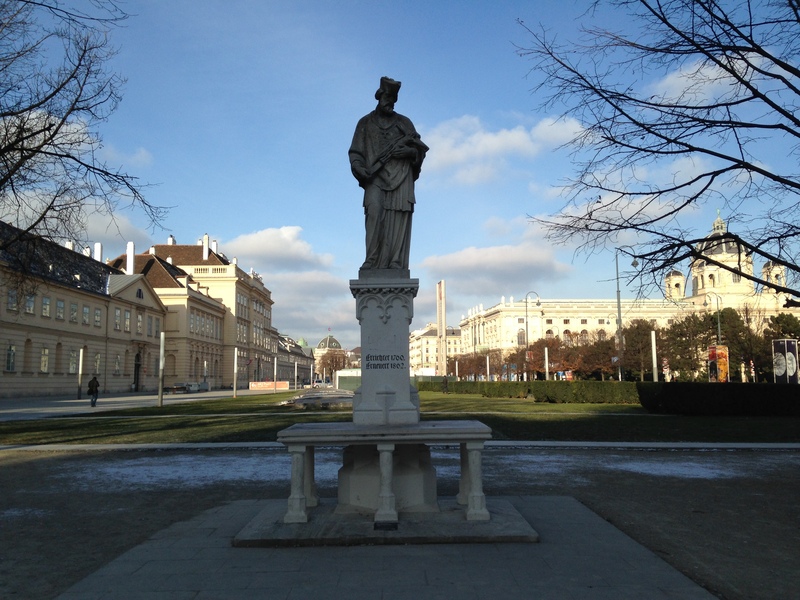 Once we finished eating, we made our way to Hofburg Palace. Schönbrunn was not always a popular palace and was only regularly attended as a summer palace starting in the 18th century. In contrast to this, Hofburg was used as a residence for over 600 years and was therefore the center of the Holy Roman Empire. 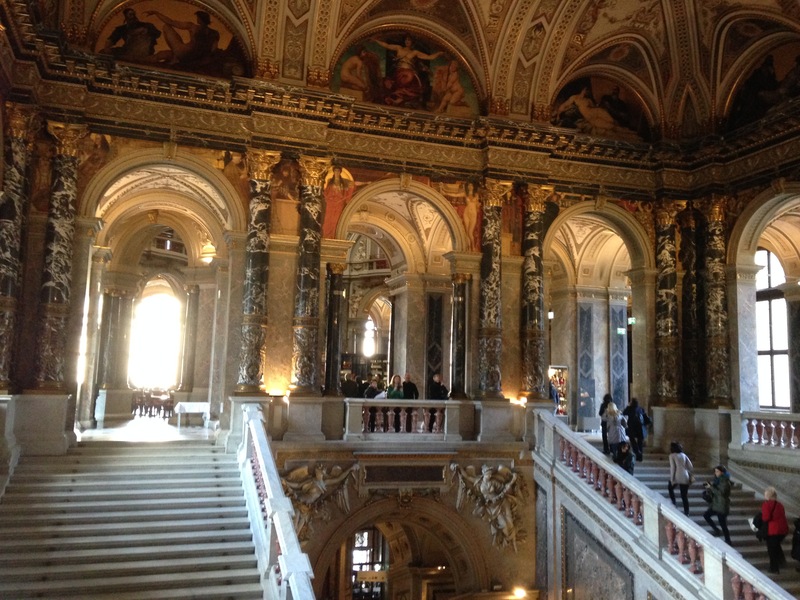 It also served as the winter palace for the Habsburgs. To be honest, the information presented in the Hofburg was pretty similar to that in Schönbrunn. That’s not to say the Hofburg wasn’t impressive, but I would say that it’s slightly less impressive than Schönbrunn (but maybe that’s just because I saw Schönbrunn first). 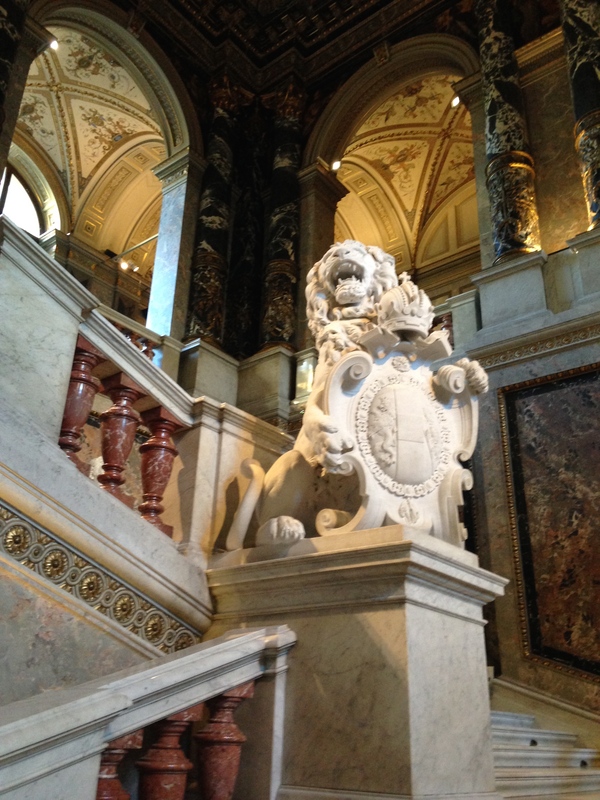 The thing that the Hofburg did have that Schönbrunn didn’t was the Imperial Silver Collection and a current exhibit focused on demystifying Empress Sisi. The overall sense that I got of Sisi was that she was a very unhappy woman who wasn’t particularly attached to her husband (who in contrast was absolutely devoted to her). She’s also well known for being particularly attached to her Bavarian family and for being obsessed with maintaining her beauty. 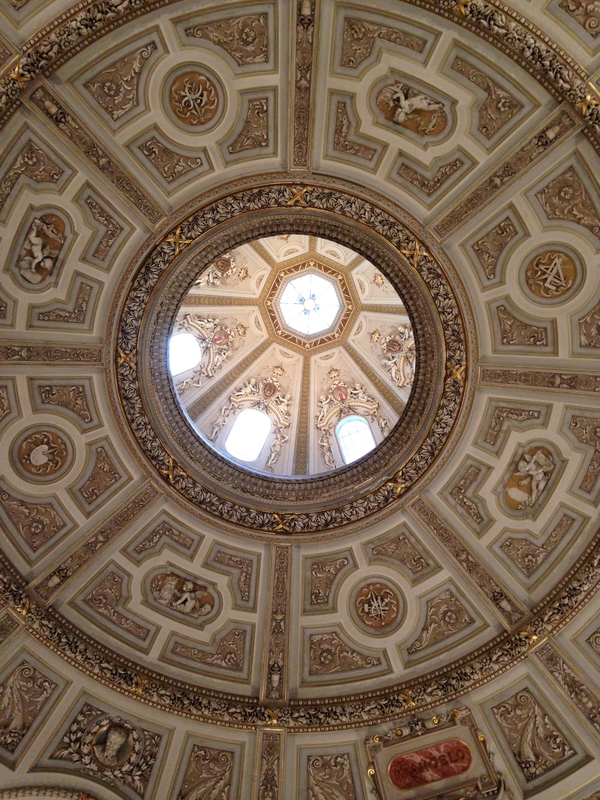 So, while the Sisi exhibit was a bit grim, I would say that overall the Hofburg is worth a visit. Afterwards we cleaned up for the opera and then headed out for a quick dinner before Rigoletto. Unfortunately, Rigoletto is a truly depressing opera. It can be summed up by saying that pretty much everyone dies or is unhappy, while the culprit, the Duke, manages to get away scot-free. I was actually pretty surprised at the lack of a good Christian moral, though I suppose “revenge is never worthwhile” might suffice. The opera is originally based off a play by Victor Hugo (who also wrote Les Misérables) so I suppose it shouldn’t have come as a surprise that the opera is decidedly sad. That being said, my Dad and I didn’t have any of this background knowledge when we bought the tickets. We mostly just knew it as a famous opera. As for the opera itself, it ended up being great. The quality of the singing more than made up for the depressing plot. We even managed to enjoy ourselves despite the fact that we could only see about 50 percent of the stage. Funnily enough, one of the opera’s most famous songs is one that I remembered from Disney’s Aristocats. If you watch the beginning of the Disney video you can see that George, the old lawyer, hums the tune “La donna è mobile” during the first 15 seconds of the video. I guess back in the day Disney was teaching me opera without me knowing it. Don’t worry, I don’t think our Duke had eyes quite as crazy as Pavarotti’s. One really great thing about the Vienna Opera is that they offer very cheap standing room tickets (we saw people queuing for them a good two hours ahead of time) and they also project the live performances on a screen outside of the building. 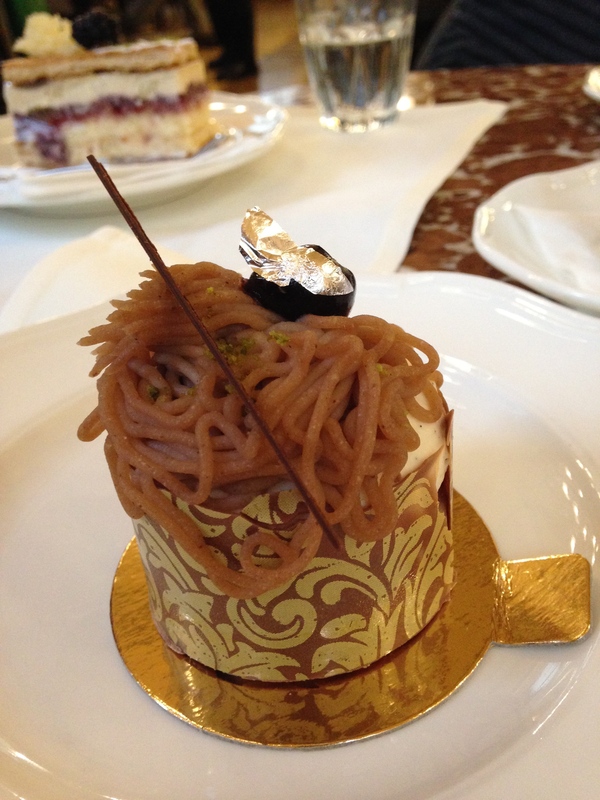 Once the opera had finished, we went to the Sacher Hotel for some of their famous Sacher torte. 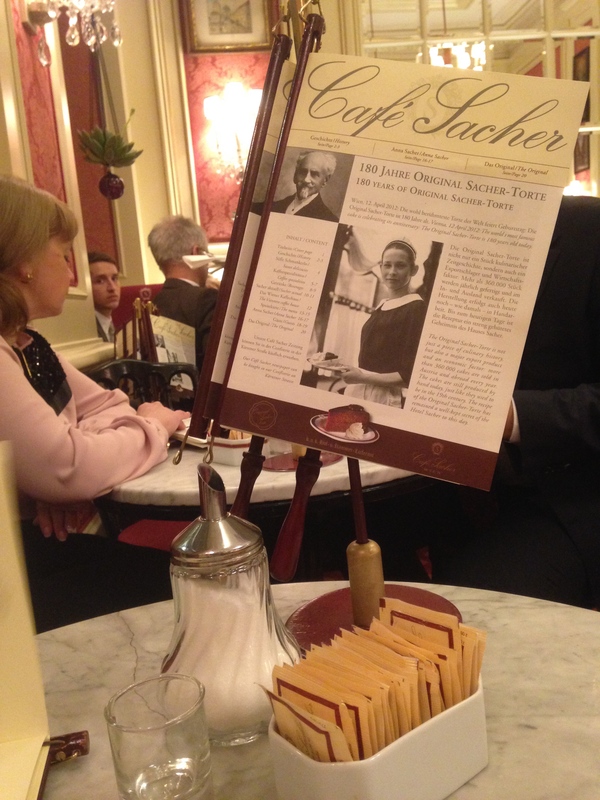 Now the Sacher Hotel is a fairly swanky place, to the extent that a man helped me out of my coat at coatcheck (he ignored me when I said I could do it myself–I felt a bit like Matthew Crawley in his early days at Downton Abbey). 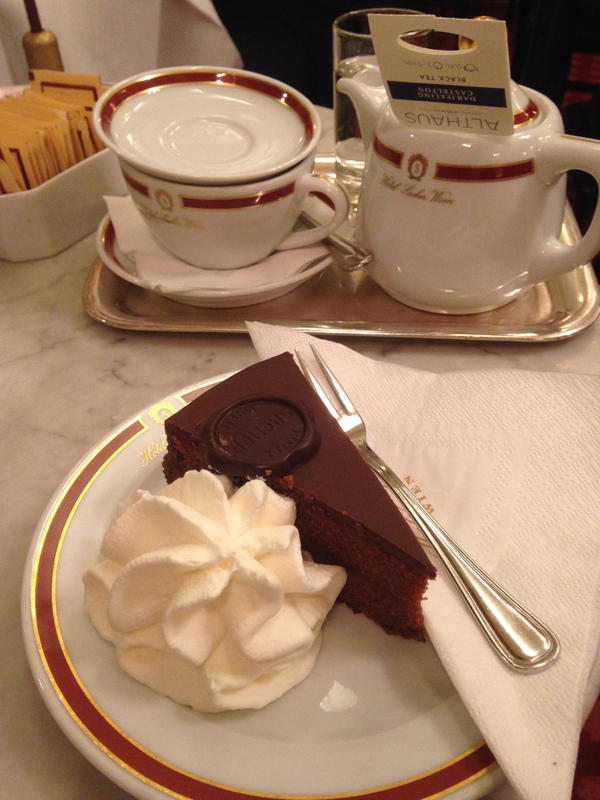 Fun fact: although the Sacher torte is a renown Viennese dessert, it was an accident. Apparently the court chef fell ill the day a lot of high ranking guests were scheduled to arrive at court, leaving the apprentice chef, Franz Sacher, to come up with a dessert. Clearly he passed with flying colors. 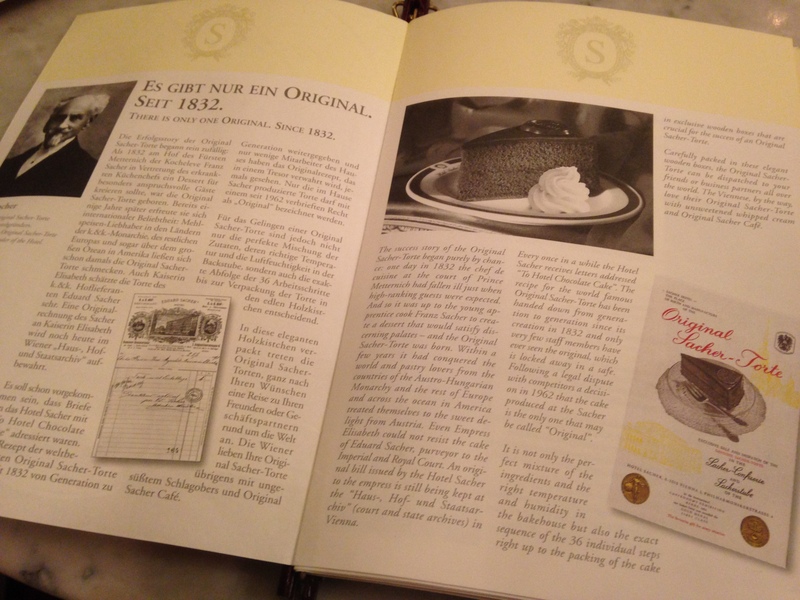 Now the Sacher torte at the Sacher Hotel is made from what is essentially a secret recipe. The recipe itself apparently requires 36 steps and exclusive wooden boxes. While this sounds like an excessive amount of effort to spend on a slice of cake, I will admit that it was pretty delicious. Thoroughly stuffed, my Dad and I gathered our coats (this time I let the man at coatcheck help me with my coat) and we walked back to our hotel for a good night’s sleep.